The annual Advent Carol Service of the Church of Ireland Theological Institute takes place this evening [9 December 2015] in Holy Trinity Church, Rathmines, Dublin, at 7 p.m. This year’s carol service takes the form of the traditional Service of Nine Lessons and Carols, and the collection is in support of the Diocese in Europe appeal for its work with refugees in Greece and throughout Europe. This appeal is being co-ordinated in the Anglican Churches on these islands on behalf of the Diocese in Europe by the Anglican mission agency Us, the new name for USPG (formerly the United Society for the Propagation of the Gospel). The students organising this year’s service have asked me this evening to read the Christmas poem, ‘Ring Out, Wild Bells,’ written in 1850 by Alfred, Lord Tennyson (1809-1892). This poem was published by Tennyson in 1850, the year he was appointed Poet Laureate. It forms part of ‘In Memoriam,’ Tennyson’s elegy to Arthur Henry Hallam, his sister’s fiancé, who had died at the age of 22. I was reintroduced to ‘Ring Out, Wild Bells’ while I was listening to Karl Jenkins’s The Armed Man, where the second, seventh and eighth stanzas are set to music by Jenkins in the finale (‘Better is Peace’). Tennyson was born in Lincolnshire in 1809, the son and grandson of Lincolnshire rectors. His father, the Revd George Clayton Tennyson, was the Rector of Somersby; his maternal grandfather, the Revd Stephen Fytche, was the Vicar of Saint James’s, Louth, and of Withcall (1780). After attending local grammar schools, Tennyson entered Trinity College, Cambridge, in 1827, where Byron and Thackeray were undergraduates too in the early 19th century. At Cambridge, he joined the Cambridge Apostles, a discussion group that began in Trinity in the 1820s and 1830s, and that has played a part in forming the minds of many leading members of the British intelligensia. Other “apostles” around that time included George Tomlinson, later Bishop of Gibraltar, the theologian and Christian Socialist Frederick Denison Maurice, Charles Darwin’s brother Erasmus Alvey Darwin, the future Archbishop of Dublin Richard Chenevix Trench, and the theologian and the Dublin-born theologian Fenton John Anthony Hort.. Later members included AN Whitehead, Bertrand Russell, GM Trevelyan, EM Forster, Lytton Strachey, Leonard Woolf, John Maynard Keynes, Rupert Brooke, Lionel Penrose, Eric Hobsbawn, Jonathan Miller and Anthony Kelly – and the Cambridge spies Guy Burgess and Anthony Blunt. He later moved to High Beach, near Epping Forest in Essex, and from there to Chapel House in Twickenham. His two-volume collection in 1842 included ‘Locksley Hall’ and ‘Ulysses.’ In ‘Ulysses,’ Tennyson had a very different understanding about Odysseus and his return home than the approach of Constantine Cavafy in yesterday’s poem, ‘Ithaka’ [1 January]. Tennyson reached the height of his career and his fame in 1850 with the publication of his masterpiece, In Memoriam AHH, a tribute to his closest friend at Cambridge, Arthur Henry Hallam. In Memoriam was an immediate success, and that year Tennyson was appointed Poet Laureate in succession to William Wordsworth. His later works included ‘The Charge of the Light Brigade’ (1855), and in 1885 he was given a peerage. Tennyson died on 6 October 1892 at Aldworth, at the age of 83, and was buried in Westminster Abbey. A memorial was erected in All Saints’ Church, Freshwater, on the Isle of Wight, where the rest of his family is buried, and there is a large statue of him the ante-chapel in Trinity College Cambridge. According to a popular story, the “wild bells” in the poem were the bells of the church at Waltham Abbey. The story is told that Tennyson was staying nearby at High Beach when he heard the abbey bells being rung. 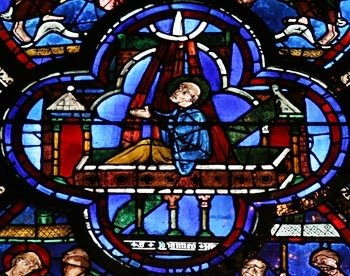 It was a stormy night, and some accounts say the bells were being swung by the wind rather than deliberately. The ‘Great Court Run’ involves attempting to run around Great Court within the time it takes the clock to strike the hour of 12, including the preparatory chiming of the four quarters and the two sets of 12 as the clock strikes each hour twice. The course is 347.5 metres long and striking the hour at 12 can take between 43 and 45 seconds. Great Court is the largest court or quad in either Cambridge or Oxford, and Trinity undergraduates regularly attempt this feat, while athletically-inclined members of Trinity attempt the run every year at noon on the day of the Matriculation Dinner. The Great Court Run forms a central scene in David Putnam’s film Chariots of Fire (1981), although it was filmed in Eton and not in Trinity. In our tutorial group, we have been look at “Heroes” – Heroes of the Bible and Heroes of the Faith. Earlier this semester I introduced Dean Gonville ffrench-Beytagh. Now we have turned to Biblical figures, and this morning I want to introduce Saint John the Evangelist, or Saint John the Divine. Saint John the Evangelist, the author of the Fourth Gospel, is also known as Saint John the Divine and Saint John of Patmos, and as the Beloved Disciple. Yet, while the Fourth Gospel refers to an unnamed “Beloved Disciple,” the author of the Gospel seems interested in maintaining his internal anonymity. He is celebrated in the Calendar of the Church two days after Christmas Day, on 27 December, and the Prologue to Saint John’s Gospel is one of the traditional readings on Christmas Day, so many of our parishioners will be familiar with his writings at this time of the year, although not familiar with his life story. 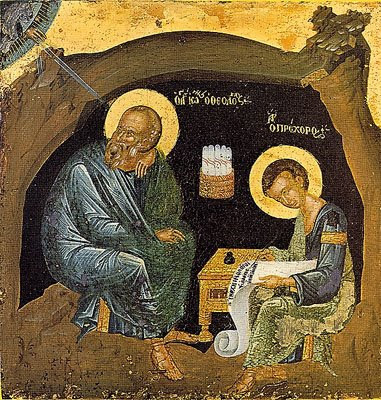 Saint John the Evangelist (Hebrew, Yoḥanan, ‘God is gracious,’ Greek, Ἰωάννης) is identified with the ‘Beloved Disciple’ who is unnamed in the Fourth Gospel. He is also identified traditionally as the author of the Fourth Gospel, the three Johannine Letters (I John, II John and II John) and the Book of Revelation, , which we are reading in the lectionary in chapel these weeks. ● the disciple who first recognises Christ standing on the lake shore following the Resurrection. So, Saint John the Evangelist is identified with John who was a Galilean, the son of Zebedee and Salome, and the brother of James the Greater. In the Gospels the two brothers are often called “the sons of Zebedee” after their father, and Christ calls them the “sons of thunder” (ἐπέθηκεν αὐτοῖς ὀνόμα[τα] Βοανηργές, ὅ ἐστιν Υἱοὶ Βροντῆς, “he gave to them the names Boanerges, which means Sons of Thunder”, see Mark 3: 17). Originally they were fishermen who fished with their father in the Lake of Genesareth. However, for a time they became time disciples of Saint John the Baptist, and were called by Christ from the circle of John's followers, together with along with Saint Andrew and Saint Peter (see John 1: 35-42). In the Gospel lists of the Twelve, Saint John is listed second (Acts 1: 13), third (Mark 3: 17) or fourth (Matthew 10: 3; Luke 6: 14), yet always after Saint James, apart from a few passages (Luke 8: 51; 9: 28; Acts 1: 13). Peter, James and John are the only witnesses of the raising of Jairus’s daughter (Mark 5: 37), the Transfiguration (Matthew 17: 1), and Christ’s Agony in Gethsemane (Matthew 26: 37). John and Peter alone are sent into the city to prepare for the Last Supper (Luke 22: 8). At the Last Supper, John sits beside Christ, reclining next to him (John 13: 23, 25). According to the general interpretation, John is “another disciple” who, with Peter, follows Christ after the arrest into the courtyard of the high priest (John 18: 15). The Beloved Disciple, alone among the Twelve, remains with Christ at the foot of the Cross with the Mother of Christ and the women and he is asked by the dying Christ to take Mary into his care (John 19: 25-27). After Mary Magdalene’s report of the Resurrection, Peter and the “other disciple” are the first to go to the grave, and the “other disciple” is the first to believe that Christ is truly risen (John 20: 2-10). When the Risen Christ appears at the Lake of Genesareth, “that disciple whom Jesus loved” is the first of the seven disciples present who recognises Christ standing on the shore (John 21: 7). After the Ascension and the Day of Pentecost, John and Peter take prominent roles in guiding the new Church. He is with Peter at the healing of the lame man in the Temple (Acts 3: 1-11), and is thrown into prison with Peter (Acts 4: 3). Again, we find him with Peter visiting the newly converted people of Samaria (Acts 8: 14). Scenes from the life of Saint John the Evangelist in the chapel of Saint John’s College, Cambridge: on the left, he survives being thrown into boiling oil outside the Latin gate (ante portam Latinam); on the right, he survives drinking from a poisoned chalice. After the Ascension, Saint John travels to Samaria and is thrown into prison with Saint Peter (Acts 4: 3). Saint Paul names John, alongside James and Peter (Cephas), as pillars of the Church in Jerusalem (see Galatians 2: 9). When Paul returns to Jerusalem after his second and third journeys (Acts 18: 22; 21:17 ff), he does not seem to meet John there. Perhaps John remained there for 12 years until the persecution of Herod Agrippa I led to the scattering of the Apostles throughout the Roman Empire (cf. Acts 12: 1-17). A Christian community is already living in Ephesus before Saint Paul’s first labours there (see Acts 18: 24-27, where the leading Christians included Priscilla and Aquila), and tradition associates Saint John the Evangelist with Ephesus, where he is said to have lived and been buried. According to a tradition mentioned by Saint Jerome, in the second general persecution, in the year 95, Saint John was apprehended by the Proconsul of Asia and sent to Rome, where he was miraculously preserved from death when he was thrown into a vat or cauldron of boiling oil. The Church of Saint John Lateran (San Giovanni a Porta Latina), which is dedicated to him, was built near the Latin Gate (Porta Latina), the traditional scene of this event. Because of this trial, the Early Fathers of the Church give him the title of martyr. According to ancient tradition, during the reign of the Emperor Domitian, Saint John was once given a cup of poisoned wine, but he blessed the cup and the poison rose out of the cup in the form of a serpent. Saint John then drank the wine with no ill effect. A chalice with a serpent signifying the powerless poison is one of his symbols, so that the image of Saint John with the poisoned chalice is still seen above the main gate of Saint John’s College, Cambridge. Domitian banished Saint John into the isle of Patmos. It was during this period that John experienced those heavenly visions which he recorded in the Book of Revelation in the year 96. The Book of Revelation tells us that its author was on the island of Patmos “for the word of God and for the testimony of Jesus” when he was received this revelation in a cave (see Revelation 1: 9, one of the appointed readings in the Church of Ireland lectionary for yesterday [8 December 2015]). After the death of Domitian, it is said, Saint John returned to Ephesus in the year 97, and there tradition says he wrote his gospel about the year 98. He is also identified with the author of the three Johannine Epistles in the New Testament. By the late second century, the tradition of the Church was saying that Saint John lived to old age in Ephesus. Jerome, in his commentary on Chapter 6 of the Epistle to the Galatians (Jerome, Comm. in ep. ad. Gal., 6, 10), tells the well-loved story that Saint John the Evangelist continued preaching in Ephesus even when he was in his 90s. He was so enfeebled with old age that the people carried him into the Church in Ephesus on a stretcher. When he was no longer able to preach or deliver a long discourse, his custom was to lean up on one elbow on each occasion and to say simply: “Little children, love one another.” This continued on, even when the ageing John was on his death-bed. According to Eusebius, Saint John died in peace at Ephesus, in the third year of Trajan, that is, the year 100, when he was about 94 years old. According to Saint Epiphanius, he was buried on a mountain outside the town. The Basilica of Saint John the Theologian gave the later name of Aysoluk to the hill above the town of Selçuk, beside Ephesus. The Epistles and the Book of Revelation presuppose that their one author John belonged to the multitude of personal eyewitnesses of the life and work of Christ (see especially I John 1: 1-5; 4: 14), that he lived for a long time in Asia Minor, that he was thoroughly acquainted with the conditions in a variety Christian communities there, and that he was recognised by all Christian communities as leader of this part of the Church. Collectively, the Gospel, the three Epistles, and Revelation are known as Johannine literature. Christian tradition identified Saint John the Apostle as the author of the Gospel, the three Epistles and the Book of Revelation that bear his name. However, within Johannine literature, Revelation bears the least grammatical similarity to the Gospel, and modern scholarship is divided about the Johannine authorship of these texts. 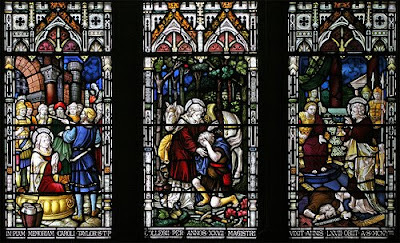 The most widely accepted view is that – whether or not the same man wrote all the Johannine works – it all came out of the same community in Asia Minor, which had some connections with Saint John the Evangelist, Saint John of Patmos, and John the Presbyter. The author of Saint John’s Gospel of John never identifies himself by name, but the text identifies him as the “Beloved Disciple” repeatedly referred to in the Gospel. Why am I so drawn to the Johannine literature, and why has this influenced my choice of Saint John to introduce this series of studies? First, I find the Prologue to the Gospel (John 1: 1-14) one of the greatest pieces of literature and poetry in the New Testament. For Saint John, there is no annunciation, no nativity, no crib in Bethlehem, no shepherds or wise men, no little stories to allow us to be sentimental and to muse. He is sharp, direct and gets to the point: “In the beginning …” But traditionally, the prologue to Saint John’s Gospel is one of the traditional Gospel readings for Christmas Day. 2 οὗτος ἦνἐν ἀρχῇ πρὸς τὸν θεόν. καὶ ἡ σκοτία αὐτὸ οὐ κατέλαβεν. 6 Ἐγένετο ἄνθρωποςἀπεσταλμένος παρὰ θεοῦ, ὄνομα αὐτῷ Ἰωάννης: 7 οὗτος ἦλθεν εἰς μαρτυρίαν, ἵναμαρτυρήσῃ περὶ τοῦ φωτός, ἵνα πάντες πιστεύσωσιν δι' αὐτοῦ. 8 οὐκ ἦν ἐκεῖνος τὸφῶς, ἀλλ' ἵνα μαρτυρήσῃ περὶ τοῦ φωτός. 9 ην τὸ φῶς τὸ ἀληθινόν, ὃ φωτίζειπάντα ἄνθρωπον, ἐρχόμενον εἰς τὸν κόσμον. καὶ ὁ κόσμος αὐτὸν οὐκ ἔγνω. καὶ οἱ ἴδιοι αὐτὸνοὐ παρέλαβον. 12 ὅσοι δὲ ἔλαβον αὐτόν, ἔδωκεν αὐτοῖς ἐξουσίαν τέκνα θεοῦγενέσθαι, τοῖς πιστεύουσιν εἰς τὸ ὄνομα αὐτοῦ, 13 οἳ οὐκ ἐξ αἱμάτων οὐδὲ ἐκθελήματος σαρκὸς οὐδὲ ἐκ θελήματος ἀνδρὸς ἀλλ' ἐκ θεοῦ ἐγεννήθησαν. In art, Saint John the Evangelist is frequently represented as an Eagle, symbolising the heights to which he rises in the first chapter of his Gospel. Secondly, I am constantly overwhelmed and in awe of the emphasis on love and light throughout the Johannine letters, whether or not you argue that the author of the Fourth Gospel is also the author of I John, or even of II John and II John. 13 Ταῦτα ἔγραψα ὑμῖν ἵνα εἰδῆτε ὅτι ζωὴν ἔχετε αἰώνιον, τοῖς πιστεύουσιν εἰς τὸ ὄνομα τοῦ υἱοῦ τοῦ θεοῦ. 14 καὶ αὕτη ἐστὶν ἡ παρρησία ἣν ἔχομεν πρὸς αὐτόν, ὅτι ἐάν τι αἰτώμεθα κατὰ τὸ θέλημα αὐτοῦ ἀκούει ἡμῶν. 15 καὶ ἐὰν οἴδαμεν ὅτι ἀκούει ἡμῶν ὃ ἐὰν αἰτώμεθα, οἴδαμεν ὅτι ἔχομεν τὰ αἰτήματα ἃ ᾐτήκαμεν ἀπ' αὐτοῦ. 16 Ἐάν τις ἴδῃ τὸν ἀδελφὸν αὐτοῦ ἁμαρτάνοντα ἁμαρτίαν μὴ πρὸς θάνατον, αἰτήσει, καὶ δώσει αὐτῷ ζωήν, τοῖς ἁμαρτάνουσιν μὴ πρὸς θάνατον. ἔστιν ἁμαρτία πρὸς θάνατον: οὐ περὶ ἐκείνης λέγω ἵνα ἐρωτήσῃ. 17 πᾶσα ἀδικία ἁμαρτία ἐστίν, καὶ ἔστιν ἁμαρτία οὐ πρὸς θάνατον. 18 Οἴδαμεν ὅτι πᾶς ὁ γεγεννημένος ἐκ τοῦ θεοῦ οὐχ ἁμαρτάνει, ἀλλ' ὁ γεννηθεὶς ἐκ τοῦ θεοῦ τηρεῖ αὐτόν, καὶ ὁ πονηρὸς οὐχ ἅπτεται αὐτοῦ. 19 οἴδαμεν ὅτι ἐκ τοῦ θεοῦ ἐσμεν, καὶ ὁ κόσμος ὅλος ἐν τῷ πονηρῷ κεῖται. 20 οἴδαμεν δὲ ὅτι ὁ υἱὸς τοῦ θεοῦ ἥκει, καὶ δέδωκεν ἡμῖν διάνοιαν ἵνα γινώσκωμεν τὸν ἀληθινόν: καὶ ἐσμὲν ἐν τῷ ἀληθινῷ, ἐν τῷ υἱῷ αὐτοῦ Ἰησοῦ Χριστῷ. οὗτός ἐστιν ὁ ἀληθινὸς θεὸς καὶ ζωὴ αἰώνιος. 21 Τεκνία, φυλάξατε ἑαυτὰ ἀπὸ τῶν εἰδώλων. 1 Everyone who believes that Jesus is the Christ has been born of God, and everyone who loves the parent loves the child. 2 By this we know that we love the children of God, when we love God and obey his commandments. 3 For the love of God is this, that we obey his commandments. And his commandments are not burdensome, 4 for whatever is born of God conquers the world. And this is the victory that conquers the world, our faith. 5 Who is it that conquers the world but the one who believes that Jesus is the Son of God? 14 And this is the boldness we have in him, that if we ask anything according to his will, he hears us. 15 And if we know that he hears us in whatever we ask, we know that we have obtained the requests made of him. 16 If you see your brother or sister committing what is not a mortal sin, you will ask, and God will give life to such a one—to those whose sin is not mortal. There is sin that is mortal; I do not say that you should pray about that. 17 All wrongdoing is sin, but there is sin that is not mortal. 18 We know that those who are born of God do not sin, but the one who was born of God protects them, and the evil one does not touch them. 19 We know that we are God’s children, and that the whole world lies under the power of the evil one. 20 And we know that the Son of God has come and has given us understanding so that we may know him who is true; and we are in him who is true, in his Son Jesus Christ. He is the true God and eternal life. (Revd Canon Professor) Patrick Comerford is lecturer in Anglicanism, Liturgy and Church History, the Church of Ireland Theological Institute. These notes were prepared for a discussion in a tutorial group with MTh students on Wednesday 9 December 2015. We are half-way into the second week of Advent, and this evening [9 November 2015], the students and staff of the Church of Ireland Theological Institute are holding are annual carol service at 7 p.m. in Holy Trinity Church, Rathmines. This year the service takes the form of the traditional Service of Nine Lessons and Carols. The collection this year is going to the Advent Appeal launched by the Anglican mission agency Us (the new name for USPG, the United Society for the Propagation of the Gospel) on behalf of the Diocese in Europe and its work with refugees, especially from Syria, in Greece and throughout Europe this winter. This is work that makes the selfless love of Christ visible among suffering people in their very plight today. Throughout Advent this year, I am tracing my way through my own Advent Calendar. As we wait and prepare for Christmas, I am inviting you to join me each morning for a few, brief moments in reflecting on the meaning of Advent through the words of the great German theologian and martyr, Dietrich Bonhoeffer (1906-1945). Readings (Church of Ireland lectionary): Psalms 11, 12; Amos 8: 1-14; Revelation 1: 17 – 2: 7.